Flourescent highlighters are ideal for highlighting or underlining text on all types of pages, including photocopies and fax paper. 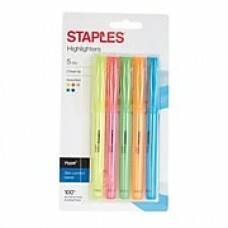 The smaller, pen-style barrel allows you to hold the highlighter comfortably and with more control. Highlighters feature narrow chisel tips for precision marking and are quick-drying so there is no worry of smudges.